I’m a bit slow to blog about this but better late than never. The topic is the satellite formerly known as GLAST (which was an acronym: Gamma-ray Large Area Space Telescope) and which is now called Fermi (which isn’t an acronym, but a late and great physicist). I’ve got nothing against the change of name but I rather enjoyed seeing GLAST in titles of papers and conference talks, particularly in combination with the complementary ground-based facility HESS (another acronym: High Energy Stereoscopic System, situated in Namibia). “Astronomy with Hess and Glast” always sounded to me it should be like Astronomy with Sturm und Drang, or something like that. Astronomy with Hess and Fermi just doesn’t sound as exciting. 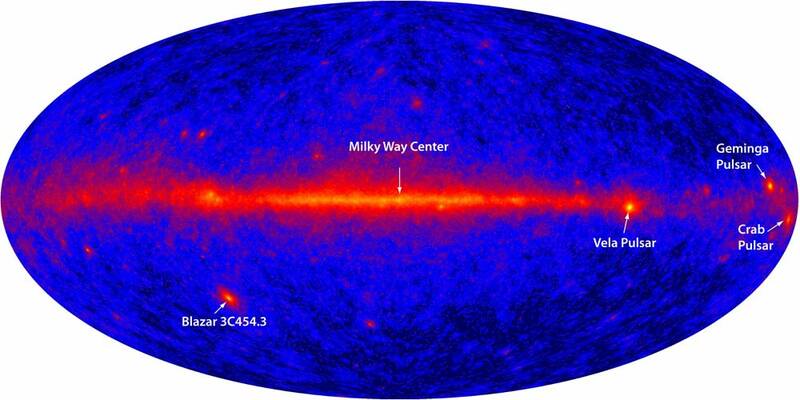 As expected, the Galactic Plane shows up quite brightly in gamma rays because of the collisions between dust particles and high-energy cosmic rays. There are also a couple of supernova remnants nearby and one nearby active galaxy 3C454.3 outside our galaxy. It’s too early to say how many other sources Fermi will identify but it’s certainly a very promising start. Actually things are looking up elsewhere in the high-energy astrophysics world too, as reported on cosmic variance recently, with a number of tantalising indications of immense potential interest discussed there. One of the exciting possibilities is that gamma ray observations might offer the chance to detect the annihilation of dark matter particles through collisions in our own Galaxy. Such collisions could chuck out gamma rays energies relating to the (unknown) mass of the dark matter particles. 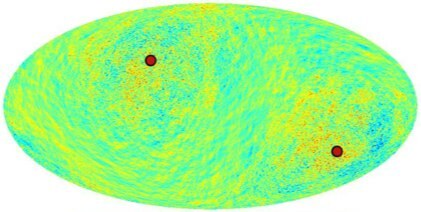 For myself, I wonder if there might be any hint that the low-level fuzz in the Fermi map might give us about the apparent lopsidedness and other anomalies in the Cosmic Microwave background?